Part 9 of the Continuous Accounting blog series. You can access the full series here. We’re currently in the fourth industrial revolution, and it’s all about technology. Technology is playing an increasingly larger role in every aspect of our lives, and opening the door to continuous improvement. According to Genpact, 76% of finance professionals agree that the new wave of digital technology is fundamentally changing the way finance operates. These are not just small modifications or simple alterations. These are foundational changes that are generating revolutionary results. Finance Departments have pursued a reduction in the close cycle for years, and there is finally a solution: Continuous Accounting. This approach more evenly distributes the amount of work that goes into financial close processes and creates a faster, more confident close. The Continuous Accounting journey begins with process improvement and automating the most manual processes of the financial close. Accountants spend fewer hours on transactional activities and can focus on addressing the exceptions. As a result, teams are able to provide high-value, strategic services in areas like fraud detection, compliance, data analytics, technology, and business advice. 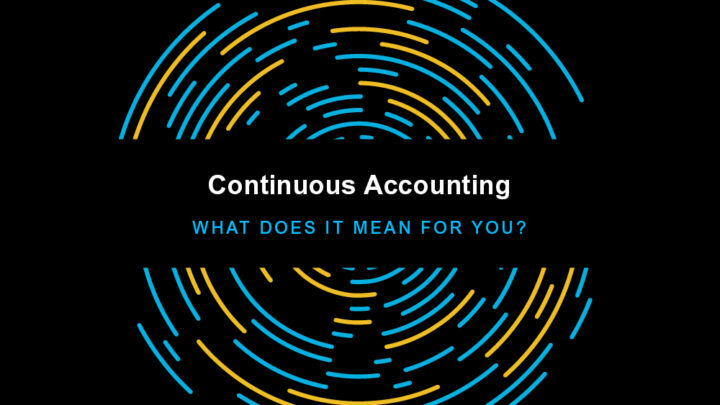 The companies who are implementing Continuous Accounting are thriving, and the time has come to define the next stage and progress toward it — because in an era of continuous change, we must make continuous improvements. The pinnacle of the Continuous Accounting approach is an on-demand close. As companies continually improve processes and automate wherever possible, transactions are processed constantly, regardless of the time zone or source system. Those transactions are automatically matched, reconciled, and analyzed as they happen. Irregularities are flagged, generating instant alerts so accounting teams can investigate issues as they arise. When this happens, the books are always up-to-date and everyone knows how the company is doing at every given point in time. This is revolutionary for accounting and finance departments, as it displays financial strength and security while building confidence in the numbers. It is an undeniable competitive advantage for company leadership to be armed with up-to-date financial intelligence and analysis at any point during the month. Instead of just reporting on the past, Finance finally guides the future. Read this ebook to learn more about how your organization can enable an on-demand financial close. Next story Has Artificial Intelligence Finally Arrived for Finance?